I have a tonne of tomatoes in the house. Every time I go to the supermarket I forget that I already have a mass and put another bag in my trolley. It’s like a nervous tick. I am terrified that I may go the fridge one day and have less than 3kg. Normally, the tomatoes I cook with either go into a salad or into a pasta sauce but here’s a great little recipe for baking them. It intensifies the flavour and is a great side dish for meat or fish. This recipe was adapted for 2-3 people, but just double it up and it’ll work for 4-6 people. Cut the tomatoes in half horizontally. Gently squeeze out the seeds and juice. Sprinkle with salt and leave for 10 minutes. Place upturned in a collander and let the juice drain out for 1-2 minutes. Pat dry with paper towels. In a pestle & mortar, pound together the anchovy and garlic into a paste. Add the parsley and pound more. Arrange the tomatoes in an ovenproof dish facing upwards. 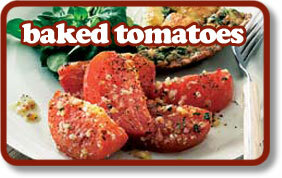 spread a little of the anchovy mixture over each tomato. Sprinkle over the breadcrumbs then drizzle over the olive oil and a little pepper. Bake in the oven for 20-25 minutes. Cool for 3-4 minutes before serving. A side dish with anything from fish to meat, chicken etc.